Worlds of Islam, Polonia Christiana, Bemowo District County Hall, August 2017. Dr. Marek Chodakiewicz introduced the civilization of Islam, explicating its history, religious and legal traditions, and various competing factions within Islam. This entry was posted in Africa, Iran, Lectures, Middle East on August 30, 2017 by liberska. Dr. Marek Chodakiewicz was invited to give a lecture at the prestigious 40th Writers’ Workshop, which took place in Washington D.C. on September 25, 2016. The Workshop’s topic this year was immigration. In his lecture, Intermarium, the Land between the Black and Baltic Seas, Dr. Chodakiewicz discussed the characteristics of the migrant crisis in various parts of Europe as well as possible American response to it. He began his analysis from the history of the Intermarium region and its crucial role for the stability of Europe and world peace. He stressed Intermarium’s Christian identity dating back to 966 A.D. as well as its unique democratic tradition. Peoples inhabiting Intermarium have developed an original form of government – an elective monarchy, in which 1 million people had the right to participate in the political process. This level of political freedom was reached by other countries of the world only in the 19th (U.S., the UK) and 20th century. This political system, known as the Polish-Lithuanian Commonwealth, is responsible for the countries of Intermarium being somehow culturally different from the countries of Western Europe. Their strong republican and individualistic tradition makes them more akin to the Unites States of America. Historical part of the lecture provided background information allowing to understand different approaches to immigration in the Western Europe and in the Intermarium region. By virtue of its cultural identity, stronger individualism and stronger beliefs, as well as a worse economic situation, the countries of Intermarium are less interesting a location for the migrants. However, the migrant crisis still results in the destabilization of the whole continent. With Russia pushing for the reintegration of what it believes to be its sphere of influence, the situation of Europe becomes more and more unpredictable. Therefore, it would be good for the United States to monitor the situation in the region and support those European allies, which are the most similar to the United States in terms of absolute values and democratic tradition. Europe, including the Intermarium, needs America’s leadership. This concerns not only defense issues via NATO, but also the Old Continent’s immigration crisis. If the United States solves its own immigration problems, this also can serve as a paradigm for its European NATO allies about the ways to address theirs. This entry was posted in Geography, Intermarium, Middle East, Past Events, Poland, Polish History, Russia, Ukraine, Uncategorized, Western Civilization on October 20, 2016 by liberska. In war, power relationships reflect selflessness and bravery, but also feed on greed and compulsion. The bellicose synergy of the Muslim overlords and their Christian dependents reflected tactical alliances, personal considerations, mercenary motives, and brazen slavery. A typical leftist newsmaker of Indian parentage, the son of a tenured UN bureaucrat and a liberal academic at New York University, Ishaan Tharoor disagrees. According to him, Muslims and Christians killed each other, but most often they killed others jointly. Throughout history Muslims fought in Christian armies and vice versa. To talk about the clash of civilizations or defense of Christendom from Islam is therefore nonsense. This is the essence of Ishaan Tharoor’s belief, or, to be more precise, his enthusiastic endorsement of Ian Almond’s deeply flawed relativist and multiculturalist argument in Two Faiths, One Banner: When Muslims Marched With Christians Across Europe’s Battlegrounds (Cambridge, MA: Harvard University Press, 2009). This entry was posted in Articles, Book Reviews, Middle East, Western Civilization on April 7, 2016 by liberska. Dr. Marek Jan Chodakiewicz was interviewed on the “Exceptional Conservative” radio show on Thursday, 4 April. The show is available worldwide, including to our servicemen and women on all fronts. The topics included the current crisis in the Far East, the future of NATO, and situation in the Levant. Dr. Chodakiewicz advised that the first step to defuse the war scare on the Korean Peninsula would be to negotiate with China. After all, Beijing uses Pyongyang as a proxy to divert American energies, and it can also rein the North Koreans in. He continued that the most likely cause of Kim Jong-un’s saber-rattling is a scheme to extract more aid from the United States and to intimidate both his own subjects and his neighbors with a show of force. Undoubtedly the young Kim wishes to breathe new life in the perpetual state of emergency that is North Korea’s raison d’etre and, perhaps, to upstage his own predecessors. Dr. Chodakiewicz also pointed out that one of the reasons preventing South Korea from reuniting the peninsula and wiping out the communist tyranny in Pyongyang is internal subversion. For instance, leftist teachers whitewash the north and inculcate young South Koreans, including army recruits, to blame the US for the Korean War of 1950-1953. In any case, the United States must not “lead from behind,” but should assure the regional players and allies that Washington is committed to their defense. To accomplish this, we would be prudent to exhaust all of the available instruments of statecraft. For example, missile defense installations in Guam may be part of a strategy to deter North Korea, even if states such as China and Russia perceive US-led missile defense as a “threat.” Naturally, countries which view us as enemy number one will always view any strengthening of our defensive capabilities as a “danger.” Otherwise, if the United States fails to lead, other East Asian states threatened by North Korea and China—including Japan—may pick up the sword once again, further destabilizing the Pacific Rim. Dr. Chodakiewicz also discussed the situation on the western edges of Eurasia. He argued that, in spite of the weakening of its cohesion after the implosion of the Soviet Union, NATO should be maintained. In short-run, we need NATO for logistical reasons. It is important to remember that we would be unable to fight the wars in Iraq and Afghanistan without the hub in Germany. In the long-run, we have nothing else to replace NATO with. Further, dismantling the alliance would only embolden post-Soviet Russia and anti-American forces in Europe. Thus, a Berlin-Moscow-Beijing axis would be a likely result. To listen to the entire broadcast, please visit the “Exceptional Conservative” Radio Show. This entry was posted in Geography, Middle East, News, Russia and tagged Conservatism, Institute of World Politics, Marek Jan Chodakiewicz, NATO, North Korea on April 12, 2013 by Pawel Styrna. 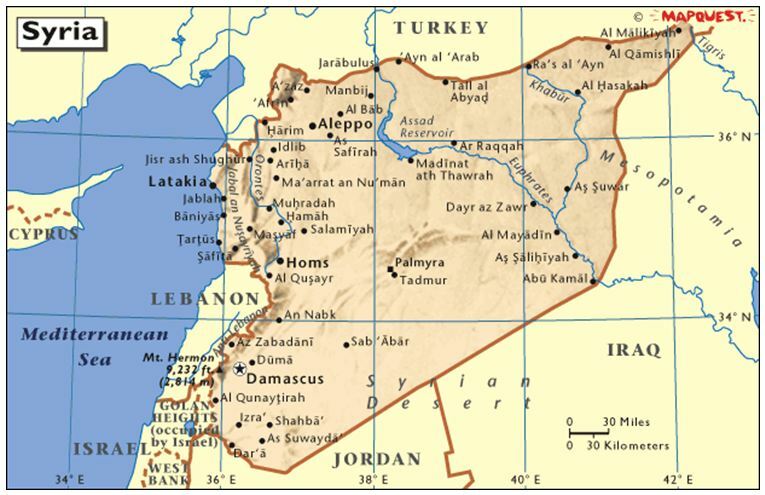 In a recent article, published on the website of the Selous Foundation for Public Policy Research (SFPPR), Dr. Marek Jan Chodakiewicz examined post-Soviet Russia’s support for Bashar al-Assad’s Arab national-socialist (Ba’athist) regime in Syria. Moscow is not the only actor playing its own geopolitical game in this civil-war-ravaged Arab state. As Dr. Chodakiewicz demonstrates, other powers-including the U.S., France, Turkey, Israel, and Iran-all have stakes in the future of the strategic Middle Eastern country. Putin’s Russia has a clear interest in buttressing a non-Islamist but anti-Western dictatorship which, like the Islamic Republic of Iran, fits into post-Soviet Russia’s neo-Cold-War alignment to counter American power throughout the world. At the same time, Dr. Chodakiewicz points out, the West should not be surprised if the Kremlin finds a convenient modus vivendi with a potential Islamist government in Damascus. Or with the United States. To read Dr. Chodakiewicz’s analysis, please click here. This entry was posted in Middle East, News, Russia on December 5, 2012 by IWP. Prof. Marek Chodakiewicz, the holder of IWP’s Kościuszko Chair of Polish Studies, has been interviewed by host Ken McClenton on the “Exceptional Conservative” radio show, along with Cato Institute’s Patrick Basham, on 21 October, i.e. the evening of the last presidential debate. The show is beamed worldwide, including to our servicemen and women on all fronts. The discussion focused on US foreign policy towards the greater Middle East, ranging from Benghazi Gate and the Obama administration’s failure to protect American lives; through the endless negotiation process with the Islamic Republic of Iran and the illusive so-called “October surprise;” to joint Sino-Russo-Irano-Syrian ALS (combined air, land, and sea) military exercises along Syria’s Mediterranean coast. Dr. Chodakiewicz pointed out that the foreign policy fiascos of the Obama administration are, at least partly, philosophical. The liberal left, he argued, is ahistorical. Its rejection of tradition and a posteriori learning helps account for why liberal administrations are so often unwilling and unable to learn from history, thereby allowing it to repeat itself. Prof. Chodakiewicz joins the conservation at the 21:00-minute point. This entry was posted in Middle East, News on October 25, 2012 by IWP.